Caged open backs are trending, and this slinky backless prom dress with strappy details looks amazing from every angle. The long formal dress features a fitted bodice with double spaghetti straps that drape over the shoulders before criss crossing over the open back for a design that is flirty and fashionable. Figure-flattering ruching at the lower back tops the fully-lined long spandex-crepe skirt that smooths over the curves before flowing down to a romantic floor length. 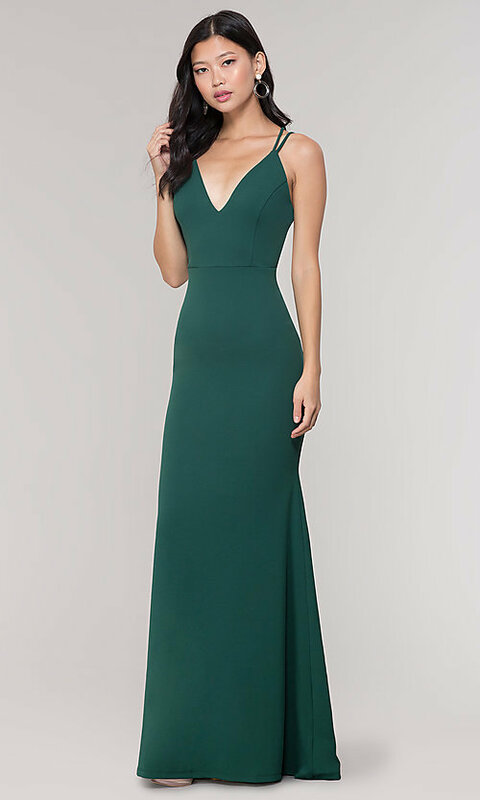 Whether you're attending prom 2019, a black-tie wedding, or another formal event, this backless long prom dress, under $100, is a classic style that wows with every turn.